Compagnia Dell'Arabica Espresso Pods . These pods are made with the gourmet blend of coffees of the company Caffé Corsini which is located in Italy. 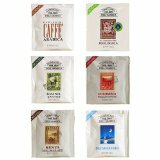 They have been producing the world's finest coffees for over the past fifty years. They are dedicated to providing products of the highest quality. They do this by hand picking the coffee cherries only when they are ripe, using only the highest grade coffees from hand picked coffee producing countries. Not compatible with Nespresso, Lavazza, Senseo or Melitta style coffee pod machines. Arabica - Purissimi Caffe Arabica - An intensely flavored coffee with full and soft aroma. Biologica Organic Arabica Coffee - Compagnia Dell Arabica - Biologica (organic) Organic Arabica Coffee. The finest, organically grown Arabica coffees from tested and certified plantations. A natural coffee with a gentle and delicate aroma. Brasil Santos - A sweet tasting coffee with low acidity, a velvety and striking aroma with a delicate hint of chocolate. Colombia Medellin Supremo - Has a light and delicate taste, medium acidity, and slightly nutty taste. Decaffeinatto - Italian espresso roast coffee -- 100% pure Arabica beans, but decaffeinated..
Espresso Pod Sampler - Sampler package of 22 single-serving (7 gm) espresso pods; 4 Purissimi Caffe Arabica, 4 Brasil Santos, 4 Columbia Medellin Supremo, 4 Kenya 'AA' Washed, 4 Biologica (organic), 2 Decaffeinatto. Italian espresso roast coffee -- 100% Arabica blends. Kenya 'AA' Washed - Very intense, strong and aromatic, with a decisive taste.